Hundreds of people are preparing for an unusual race in Alexandria, Virginia. "Don't get touched by zombies." "Run really fast. Don't get bit." "Kill Zombies!" The race is called "Survive Alexandria." SALIL MANITAHLA: "You have to keep your map all the way until the end of the race." Zombies are creatures that appear in popular culture. They are dead bodies brought back to life. They appear in horror films as the walking undead and are said to eat the brains of the living. Salil Maniktahla explains the race. SALIL MANIKTAHLA: "Zombie Tag is pretty simple. The idea of it is that we have a bunch of runners. Then zombies tag runners. And as people are tagged, they become zombies, too. The first people who make it to the end are the winners." The game is more about the living than the undead. SALIL MANIKTAHLA: "This is about the community, for people in a time when I think people kind of need something like this." The event is free, but many people donate money to help needy children. "Donations right here for Big Brothers/Big Sisters. Take your donations. Very good." Some people decided to run alone. Others formed teams. 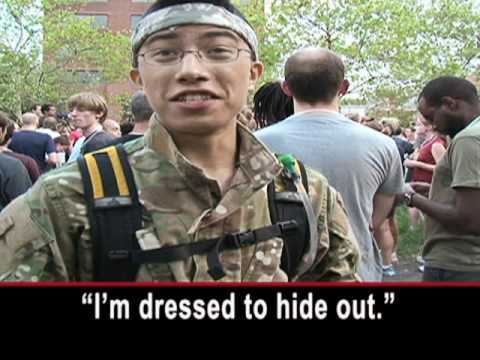 "I'm dressed to hide out." "I'm just going to run. Run and scream. Maybe try to climb stuff." "Run with people slower than us!" Some runners admit they have no chance of winning. "We have no strategy. I'm just trying to figure out where the first checkpoint is." "I decided I wasn't going to be a runner for long. So go ahead and get ready to be a zombie." "Yeah, I'm pretty much going to be toast pretty soon. So that's why I was all prepared." "I'm going to last only five minutes, for sure." Technology helps the living against the undead. "You gotta use technology when fighting zombies, the undead. That's their weakness." Each runner told a different story. "We do aerospace consulting." "Facebook!" "I don't even live here. I'm in North Carolina." "I love a good zombie movie so I figured it would be fun." "I heard it from him at work." "This is my first time in DC. I've never done this before. I don't know the area, but still I'm going to come out on top!" "No, I got trapped up against a gate, and then forcibly converted." "I got attacked by one, really buff military guy. I was ambushed." "Everyone's been tagged out so far. No one's reached to the end just yet." Organizers estimate that more than one thousand runners took part in the race. That's a lot of donations for Alexandria's young people. I'm Bob Doughty.